These films present compelling evidence that the Great Pyramid of Giza may have been a Tesla-style wireless electrical energy plant that was constructed long before the actual Egyptian civilization of historic record occupied that land. This contradicts conventional wisdom that the pyramids were built by the pharoahs for religious and burial purposes. There is no reference of any kind to pyramids in the writing of the ancient Egyptians. *materials that we presently use for technology are assumed to have been used in the past only as ornamentation, such as copper tubing. (See final paragraph under "Queen's Chamber" in this Wiki article: https://en.wikipedia.org/wiki/Great_Pyramid_of_Giza ). Note: an important word is consistently mispronounced: Piezo should be pronounced "Pee-AY-zoh" or "Pee-AY-tsoh" rather than "PEE-zee-oh." Joseph Farrell (one of my favorite authors) has an even more “outlandish” idea from his Giza Death Star “Trilogy”. The Great Pyramid of Giza was actually an ancient massive “Weapon of Mass Destruction”.. And may have played a part in the destruction of the planet between Mars and Jupiter that created the asteroid belt.. The Other Two Large Pyramds, the 'Causeways', and the 'Temples'. Also: A Phase Conjugate Howitzer Evidence of the Use of Weapons of Mass Destruction in Ancient Times; High Frequency Direct Current 'Impulse' Technology; How the Giza Death Star worked. This book takes off where Christopher Dunn's 'The Giza Power Plant' left off. It is a rollicking ride into the world of fantastic science and an even more fantastic past that is just beginning to be imagined! Wait there is more ..
Once you finish the “Giza Death Star” series the sequel to this is Joseph’s follow on book. The huge amount of scholarly research that went into this book is amazing, as well as his expert “dot connecting” that takes us up to present day history ..
Presents the history of the Exploded Planet hypothesis. Rejecting naturalist and materialist assumptions of catastrophism forwarded by other researchers, this work asserts that the causes are based in ancient myths of a Cosmic War in the heavens. Cosmic War - Interplanetary Warfare, Modern Physics & Ancient Texts by Dr. Joseph P. Farrell is an extremely intriguing incursion into the possibility of a very ancient war in high antiquity. Dr. Farrell's hypotheses of an Ancient Interplanetary War is argued in an in-depth, precise and reasonable approach. The extensive evidence Farrell collates and synthesizes in this particular book will leave the reader aghast with the possibilities. Intriguingly enough, many ancient cultures stated that the 'Wars of the Gods' were quite real. Predictably, even though there's extensive evidence for advanced physics, advanced weapons, ancient [millions and BILLIONS of year old artifacts found by reputable sources], the establishment has painted all over ancient history with myth. Thanks for giving us a lot to sink our teeth into Max! There is a book, whose complete title I cannot recall, but one of the words in the title is Battery, and the title is something like "The ____ Battery" and it is all about the Great Pyramid. Maybe it is mentioned in one of the links you provided, which I have not yet followed. 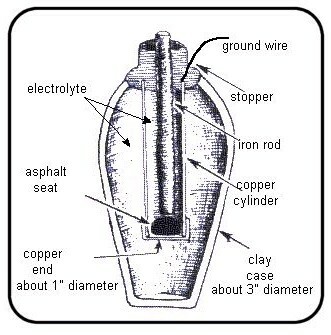 The first thing that comes to my mind Ilinda is the Baghdad Battery, but that's probably not what you're thinking of. The Bhagdad Battery is new to me, but the article/book I recall being reviewed was said to describe the Great Pyramid at Giza as a battery itself. It was an amazing read. If you can think of the title, I hope you'll post it! Did a highly advanced civilization exist in prehistory? Is the Giza Pyramid a remnant of their technology? Then, what was the power source that fueled such a civilization? The technology of harmonic resonance, claims renowned master craftsman and engineer Christopher Dunn. In a brilliant piece of reverse engineering based on twenty years of research, Dunn reveals that the Great Pyramid of Giza was actually a large acoustical device! By its size and dimensions, this crystal edifice created a harmonic resonance with the Earth and converted Earth's vibrational energies to microwave radiation. The author shows how the pyramid's numerous chambers and passageways were positioned with the deliberate precision to maximize its acoustical qualities. This may be the same technology discovered by Nikola Tesla and the solution to our own clean energy needs. Am betting this is it. Maybe in the book there was a term, the - - - - Battery, but even if not, the title says it all. Thanks for finding this gem. 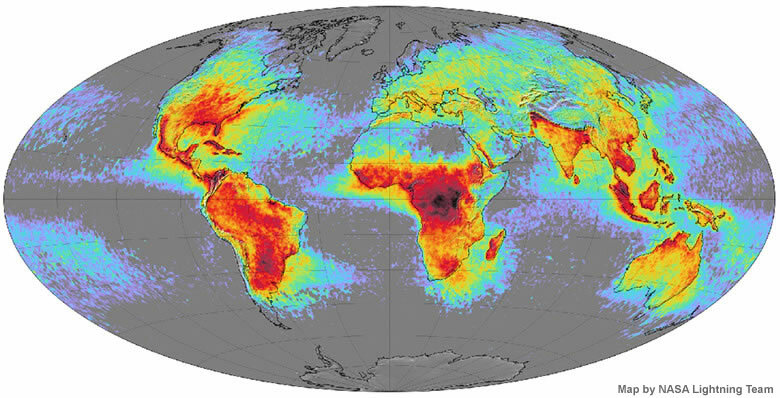 The World Lightning Map website has inadvertently demonstrated that the Egyptian pyramids don't allow lightning anywhere near them. Data was collected by NASA over several years from 1995-2002, and then averaged.